Another great season of quality racing lies ahead of us and our dedicated microsite has everything you need to get an edge on the jumps this winter. Leading Trainers from the UK and Ireland discuss their squads for the season. Kevin Blake profiles the top jumps horses in training and assesses their chances of more glory. Paul Jones selects the 15 top handicaps throughout the season for stats fans. ATR's Mike Cattermole selects youngsters with the potential to reach the top in the coming season. ATR's Sean Boyce takes a close look at the ante-post markets for the feature races this winter. Simon Rowlands selects 12 winners-in-waiting for the coming jumps campaign. Richard Pugh & Eoghain Ward pinpoint 12 former Irish pointers with potential who are set to embark on a new career under Rules. Tony Keenan shortlists 12 horses to keep onside in the Emerald Isle this season. Liz Price has nominated a dozen to follow in France in the months ahead. 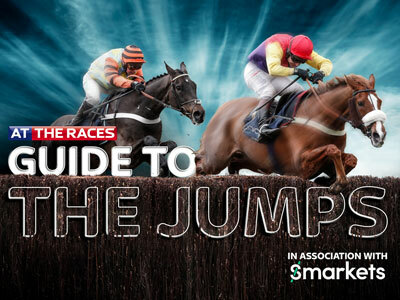 We have a whole host of key jumps trends and stats. The team preview the 2018/19 National Hunt season. Graham Dench on the highlights of another memorable season. Sign up to Smarkets and get up to £50 risk-free on horse racing. New customers only who sign up using the code HORSERACING50. £50 in risk-free bets would be applicable if you were to place £10 on five selected races after sign up. You will be refunded your net losses across applicable markets up to a maximum of £10 per race.